We raised over $3200 for young kids! Thank you! On Give to the Max Day, people and businesses in the Bird Island, Olivia, and Lake Lillian area stepped up to make a difference. Here is our recent Letter to the Editor, with a Thank you to everyone who contributed, and more about the ECI projects. Letter to the Editor – They Gave to the Max to ECI! The BOLD Early Childhood Initiative Committee (ECI) would like to thank all the individual donors who helped us reach our 2013 fundraising goal of $1600 during November’s Give to the Max Day. These donations were then generously matched by several local banks for a total over $3200. We want to thank Hometown Bank of Olivia, F&M Bank of Olivia, Frandsen Bank and Trust of Bird Island, and Citizen’s Alliance Bank of Lake Lillian for helping our youngest community members. All funds raised will continue to be used toward BOLD ECI’s mission of promoting the overall development of children age birth to five and their caregivers through outreach, innovative efforts, and community partnerships. In the past three years BOLD ECI has partnered with our local libraries to provide stickers, toys, and other prizes for kids in the “1000 Books Read Before Kindergarten”. ECI has provided 200 free tickets to Willmar Stinger Books-N-Baseball games where the players read to kids on the field encouraging early literacy. ECI partners with the United Way of West Central Minnesota to supply backpacks filled with school supplies for BOLD preschoolers. ECI helped fund monies toward the installment of twelve changing tables in local facilities. We have donated $2000 match grants toward the cities of Bird Island, Olivia, and Lake Lillian to improve playground equipment aimed at kids five years of age and younger. The City of Lake Lillian has already installed several pieces. Please check them out! The ECI sponsors an annual free concert with mini resource fair for families to network with local health, social, and school agencies to help evaluate the needs of our kids before school starts. It is also a great time for kids and their families. The ECI has also sponsored “Tubs of Fun” at each communities summer festival days. We continue to look for ways to help improve the social, educational, and health needs of the youngest kids in our community. Did you know that every dollar invested in early childhood saves $17 in welfare assistance, special education, and law enforcement later? And currently only 50% of children in Minnesota are fully prepared for kindergarten? The BOLD ECI wants to thank all of our individual and business sponsors for their continued financial support of our efforts to improve the outlook for kids in our community. We believe your investment is well spent helping our youngest community members thrive. Thank you for your support! You can learn more about the BOLD ECI or volunteering on our website at www.boldeci.com or Like Us on Facebook at http://www.facebook.com/BOLDECI. The BOLD ECI is supported by the Southwest Initiative Foundation. 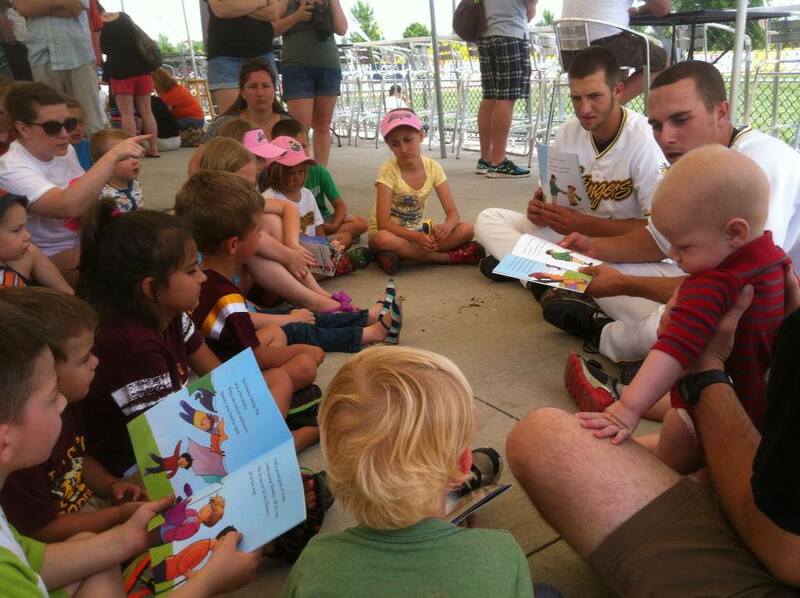 The Willmar Stingers read to the kids before the baseball game. All the kids got free books to bring home too. Give to the Max Day is the largest fundraising day in Minnesota – – and it’s TODAY, November 14, 2013. Give to the Max Day is an important day for the BOLD Early Childhood Initiative, and we kindly ask for your donation today (just click here). We have had four generous local banks challenge us to raise $1600 to earn their match for a total of $3200. We can do a lot of awesome things for young children in our area when we have the cash and the people to do it! The BOLD ECI has helped to fund 12 Changing tables in the Bird Island, Olivia, Lake Lillian area to benefit local families. Children should get 30 minutes or more of reading time each day. The BOLD ECI has helped to fund local literacy programs and donate hundreds of free books. 84 Kids came to the FREE Teddy Bear Band Event last February. If your family loved this event, please donate today so we can make more memories (see photos). 91 Kids came to our Bob the Beachcomber kick off concert in 2012 in their Hawaiian shirts. Parents loved the networking, Kids loved the dance and play (see photos. The BOLD ECI has given out 200 tickets to Willmar Stingers games to families of young kids for the special Books-n-Baseball event where a Willmar Stinger player read aloud to the kids. Help us make this and other fun events a reality again! 50% of Minnesota kids are not ready for Kindergarten. The BOLD ECI want to decrease this number in our area. The BOLD ECI is helping to sponsor the “1000 Books Before Kindergarten” program through the local libraries to increase literacy and earn stickers and toys. The BOLD ECI has offered each city of Bird Island, Olivia, and Lake Lillian a grant of $2000 (must be matched) for new playground equipment. Lake Lillian has already added new playground equipment with this matching grant, and Olivia and Bird Island are expect to in 2014. Please consider a donation to the BOLD ECI today. Our goal is to raise $1600 and earn the full match from the banks for a total of $3200, but we need your help! Thank you.